WestJet has taken part in April Fool’s Day since 2006 with a wide variety of videos mostly focusing on things that may be just a little too good to be true – like Kargo Kids, for example. This year, the airline built on friendly fun took a viral topic and related it back to itself for April Fool’s Day. 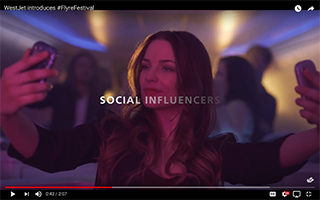 And thus, out of the ashes of Fyre Festival came WestJet’s Flyre Festival. For those of you not familiar with Fyre, the huge music event was 2017’s biggest festival flop. It was created to promote Fyre’s music booking app but the opening weekend descended into a scene from Lord of Flies when the event experienced problems with, well, pretty much everything including security, food, accommodation, medical services and artist relations, resulting in the festival being postponed indefinitely. Instead of the private planes, luxury villas and gourmet meals (and models, lots of models), promised in video and on social media for months, attendees received sandwiches, FEMA emergency tents as accommodations, and *gasp* economy seating with throngs of other festival-goers. At a cost of thousands of dollars a ticket. There’s a Flyre Sale to go along with the video. Details are here.